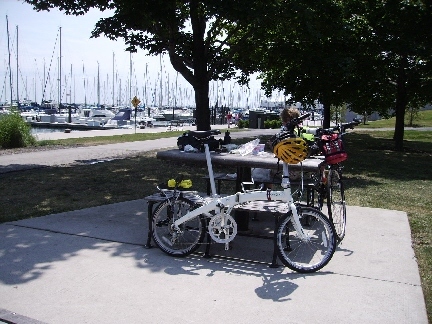 I had purchased a bicycle ticket for Jeanine's regular bike, whereas my new Dahon MuP8 folding bike went as carry-on luggage. I had decided to put the folder to the test, even though the entire ride on Amtrak was possible with a regular bike. 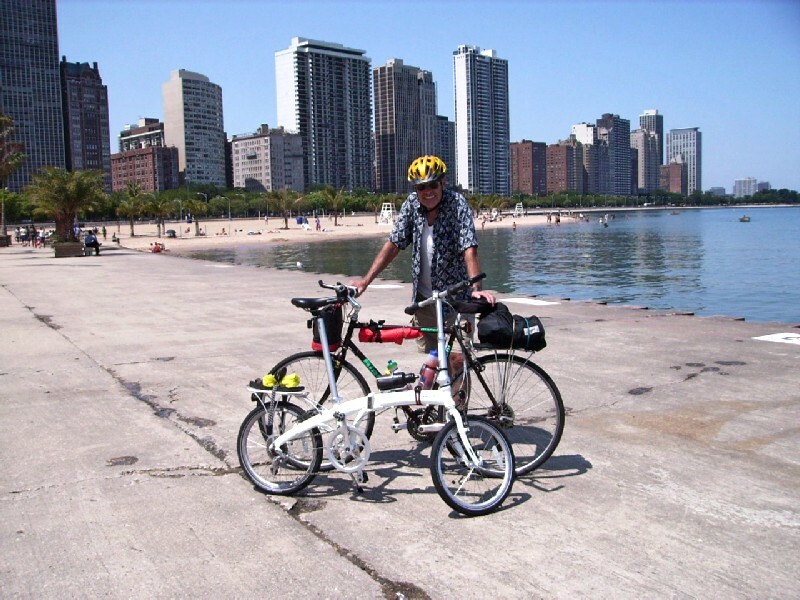 It was easier to handle and saved $60 -- (2 x $10 for round trip bike tickets on the Illinois Zephyr, 2 x $5 for handling in the baggage car round trip on the Lake Shore Limited between Chicago and Buffalo, and 2 x $15 for bike boxes (you are free to use your own box; but that was not practical in this case). We had carried bikes onto the Illinois Zephyr many times before with no problem; and in fact the conductors and assistant conductors had always been very helpful. But for the second time in a row, we encountered weirdness. This time the conductor told us to take the handle bars off the regular bike and put both bikes in the overhead luggage rack. This wasn't a problem for me; but it would have been for 67 year old or 5'1'' ladies like two in our group. 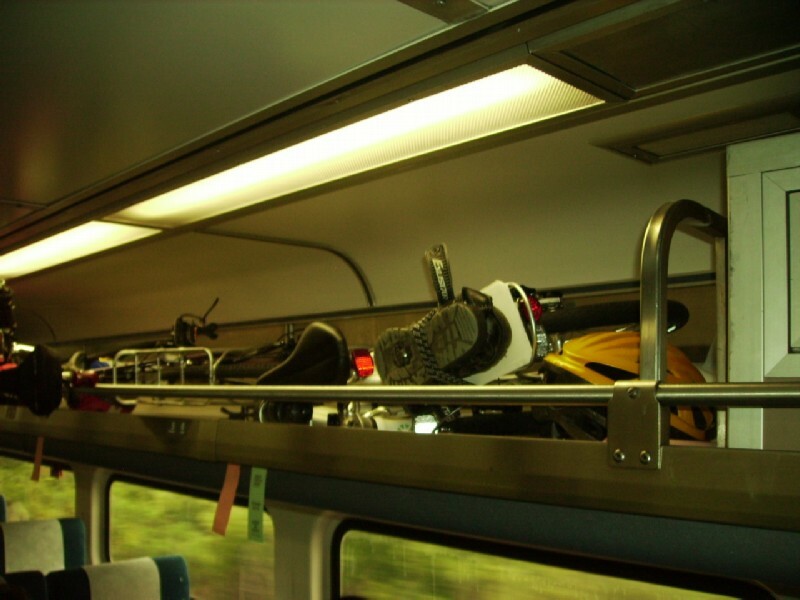 Not to mention that Amtrak's policy explicitly states folding bikes may not be stored in overhead racks. When I showed the conductor a copy of the written policy, which I always carry, her response was "that's only says folding bikes". Duh! I attribute this to the fact that both the conductor and assistant conductor are new. On the return trip we had the old crew and there was no weirdness. Bianchi Strada and Dahon Mu P8 resting comfortably in the overhead luggage rack. Bianchi Strada with handlebars removed. I pity the poor traveler who isn't mechanically inclined. We arrived at Chicago Union Station about 15 minutes early; and as usual we headed to the Metropolitan Lounge, which is available to sleeping car passengers, and checked our luggage with the red cap. 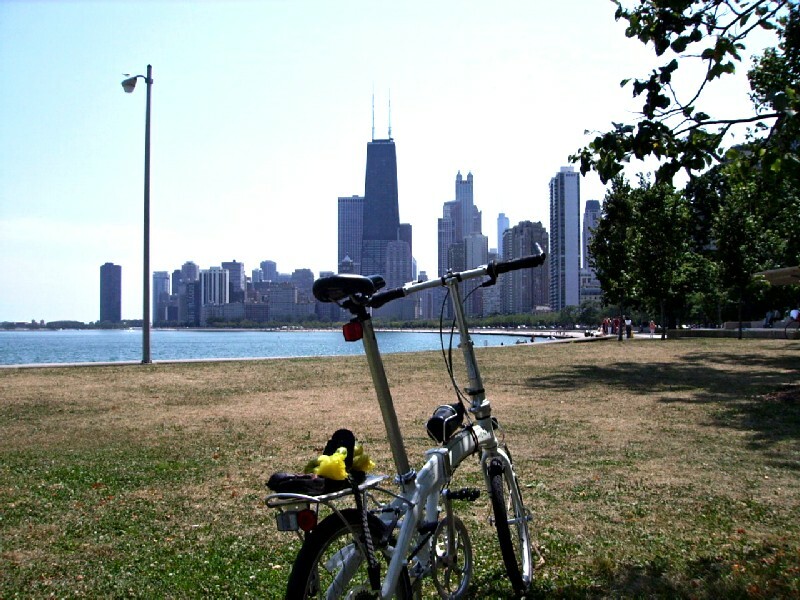 Then we took a bike ride along the Lake Michigan shoreline. In the past we had taken our life in our hands getting to the lake front via Jackson or Monroe streets. However, recently I discovered with the help of the city of Chicago bike map that the best way to reach the lake front is to go south on Clinton and east on Roosevelt Road since both have bike lanes and the bridge on Roosevelt over the railroad yards has a wide sidewalk. The return route is Roosevelt Road to Canal Street. It isn't Giordanos, but a nice lunch just the same. Unfortunately, my swim suit was back at Union Station. Heading back with the John Hancock Building in the distance. 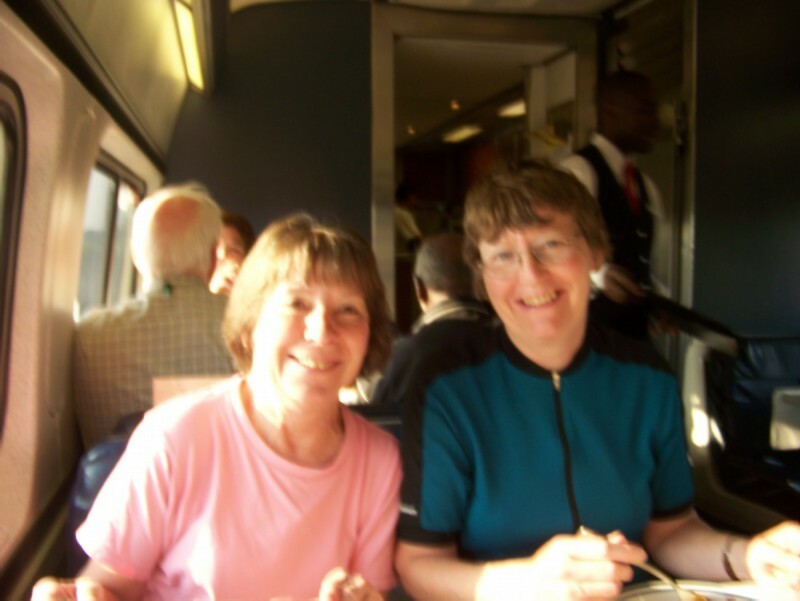 After riding 15 miles we arrived back at Union Station in time to check Jeanine's bike before meeting Janelle and Marcia coming in on the Empire Builder from St. Paul. The procedure is to have an employee unlock the elevator so you can go down into the bowels of the station to pay for the box and shipping and then pack your bike. Amtrak's boxes are extremely large; and theoretically all you have to do is remove the pedals, turn the handle bars sideways, roll the bike into the box, and seal the ends with tape supplied by Amtrak. 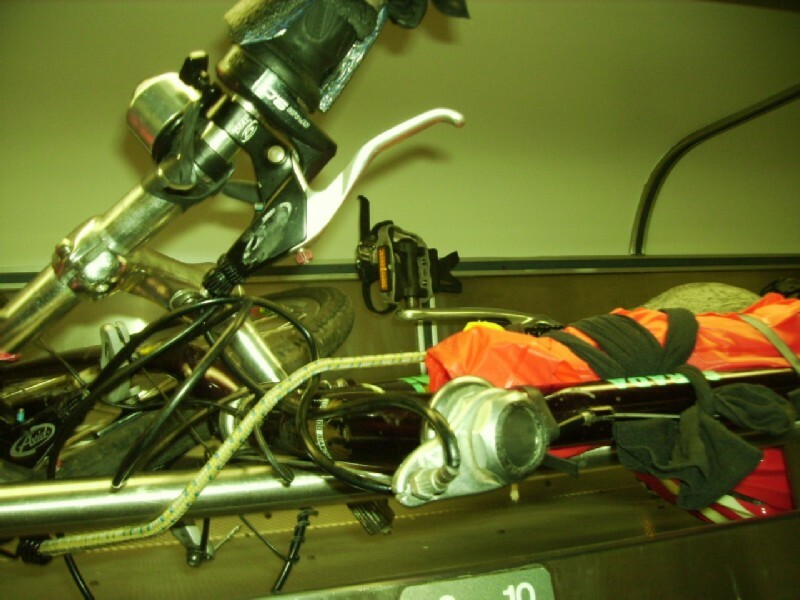 This works fine for road bikes; but even normal size bikes with straight handle bars can cause a problem. When you turn the bars sideways, one end sticks straight up in the air, making it too tall for the box. Fortunately, in Jeanine's case, you could lower the stem enough to make it fit. As we found out on the return trip, it is not as easy with threadless stems. As usual, the staff in the basement was very cordial and helpful. 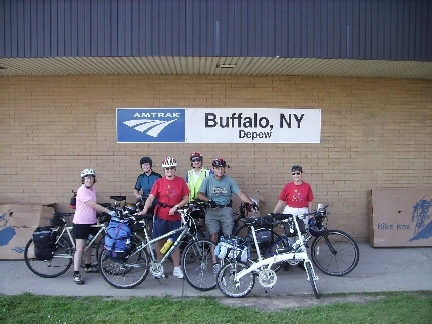 In the meantime Janelle and Marcia had arrived, not on the Empire Builder, but the "Dirty Dog". Apparently, the Minneapolis/St. Paul coach had been bad ordered, and the passengers from there were bussed to Chicago. Not a good omen. As we were making the long trudge to our sleeper in the Boston section at front of the train, I spotted a Heritage diner #8527 at the rear of the train. None of the staff seem to know why it was there. It would have been nice to use it rather than the depressing diner-lite. The walls were spartan, off-white plastic, with no decoration at all. Our only meal was breakfast; and we rated it as OK, except for the tasteless scrambled eggs. So while the rest stowed their luggage in their rooms, I stashed my folder in the luggage rack in an adjacent coach. This was one of those unknowns because, although I had never been in a Viewliner sleeping car, I knew they had no community luggage racks like superliner cars, and figured it would be a tight squeeze even in a bedroom. But like everything else on the tour except the pooch ride, it worked out fine. The fact that coach passengers had not yet boarded, taking up luggage rack space, helped the situation. Janelle and Marcia in the diner-lite for the wine and cheese. Viewliner bedroom. In the corner to the left is the toilet and shower. To the right is a sofa that converts into a bed. At the upper right is the top bunk which flops down. I lucked out with the bedroom. I had originally booked a roomette in February. Sometime in March when they reinstated through cars from Boston, moving one of the NY sleepers to the Boston section, there must have been some cancellations. Suddenly, a bedroom was cheaper than what I had paid for the roomette; so I quickly rebooked. I notified Marcia and Janelle, and they were able to rebook their roomette at an even lower price. I was looking forward to the ride because I had not taken a single level overnight train since the days of slumber coaches. The ride was very smooth and quiet, at most a swishing sound. No rattles and banging. The fact that we were in the front of the train and our room was in the middle of the car may have had something to do with the ride. Our group of four had a good sample of the diner-lite's breakfast fare. We rated everything OK, except the scrambled eggs. I've heard they are not powder; but they were terrible just the same. 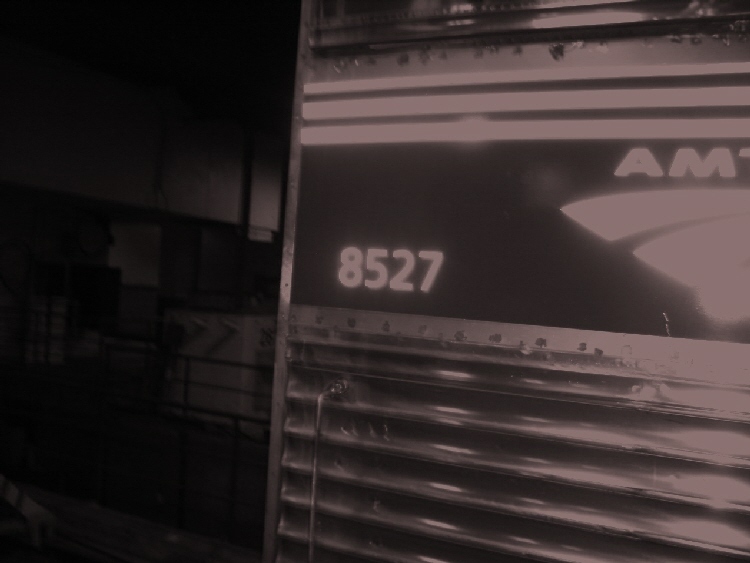 The service was very good, for Amtrak. The "Late Shore" Limited did not live up to its name as it arrived 15 minutes early at 8:15AM. With the WV group scheduled to arrive about 9:00, it would have been nice to be fashionably late and able to enjoy a more leisurely breakfast or even a shower. It did allow us to unbox and reassemble our bikes before the others arrived. As usual the bikes arrived in fine shape after their ride in the baggage car.